What’s the greatest horror game of all time? I’m willing to bet that your choice was a game with a first-person, or at least tightly-cropped, perspective. Horror relies on immersion to be effective, and a P.O.V. that puts you in the action will often enhance the experience. A new game from Polish development studio Acid Wizard called Darkwood is one of a recent batch of indie horror games that shows even unusual perspectives and simplified graphics can deliver big scares. 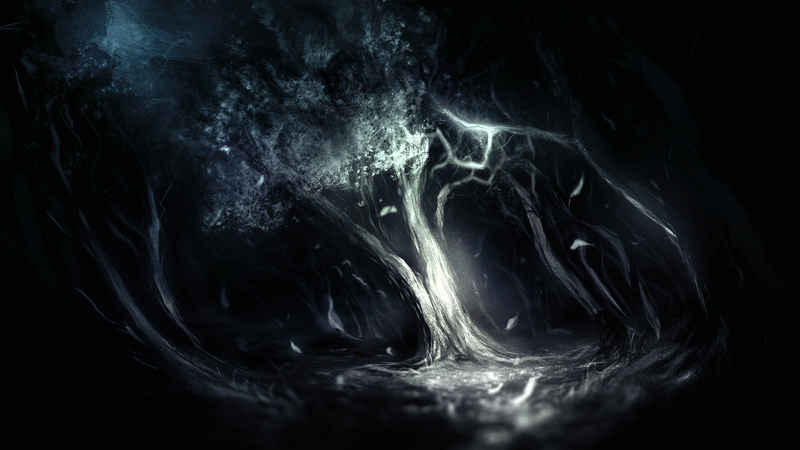 Darkwood, which I backed on Indiegogo back in 2013, puts you above the fray with a top-down perspective. While you might think that would create a large divide between the player and the protagonist, it’s surprisingly as riveting an experience as you’ll find in any first-person horror. The woods are dark and full of horrors, and they’re slowly swallowing the town and everything in it–including you, if you can’t escape. Days are spent scavenging for supplies and searching for a way out. When night falls, you hunker down in your hideout and hope the barricades and traps you’ve built are enough to keep the monsters at bay. It might be standard crafting-survival fare were it not for the fact that Darkwood is dripping with dread. The woods not only feel alive, they feel malevolent. Thick tangles of trees are oppressive and sunlight never reaches the ground. Your vision is limited to the cone of light cast by your flashlight, and as you slowly trudge on, you can’t help but anticipate something reaching out from the darkness to grab you. The footsteps around your hideout at night may signal someone coming for you, or they might only be your imagination. Which thought is more disturbing? Undoubtedly, what constitutes “disturbing” or “scary” is wildly subjective. One person’s sleepless night is another’s “Pfft, you baby, I laughed through that whole mess.” If there’s one thing we can all agree on, though, it’s that in horror, atmosphere is paramount. It’s the feeling of the thing that grabs you and stays with you. It’s the clang of falling metal in the distance as you walk down an empty hallway on the USG Ishimura in Dead Space, the dark corners and faint whispers in Fatal Frame II’s abandoned Minakami Village. There are other important factors that make up a successful horror game to be sure–a feeling of vulnerability, for example–but a healthy dose of dread goes a long way. With the right tone, games can transcend limitations of mechanics and aesthetics to deliver a true survival horror experience. One of the finest examples of this is Jasper Byrne’s Lone Survivor, a 2D, pixel art side-scroller released in 2012 that is by turns unsettling, disturbing, and intense. “You” are the protagonist, a young man in a surgical mask who just may be the only survivor of a mysterious plague that has turned the rest of the world into fleshy, zombie-like creatures. Unwilling to accept this fate, you leave your apartment in hopes of finding others who may yet live… but, as you might expect, it ain’t easy out there. During your explorations, resources such as ammo and batteries for your small flashlight are in short supply. Even worse, reality, dreams, and hallucinations intertwine and overlap, so you’re never quite sure what’s really happening. The gameplay is simple and the graphics are rudimentary, but Lone Survivor is far creepier than many of its hi-fidelity horror counterparts. It feels like a Silent Hill game pared down to its barest essence: an unreliable narrator battling an ever-encroaching darkness, shifting architecture, flesh growing in places it really shouldn’t grow, and a plot sometimes too ambiguous for its own good. Sound design is sometimes overlooked in horror games, but ultimately it’s key to creating atmosphere. In Lone Survivor it works so well I found myself hesitating to find out what exactly was shuffling at the other end of a long, dark, pixelated hallway. If Lone Survivor wears its Silent Hill influence on its sleeve, then the 2014 game Claire wears it on the front of its T-shirt. While visiting her comatose mother in the hospital, an exhausted Claire has trouble discerning dreams and nightmares from reality… and so does the player. The hospital becomes a dark, bloody labyrinth filled with shadow monsters and survivors to be saved. All the while, Claire carries only a flashlight, relying on her dog Anubis to warn her of impending danger, She may make it out alive, but she may not make it out sane. Again, the old-school pixel graphics belie a sophisticated horror story that is intensified by the sound effects and score. Navigating a 2D environment full of doors can be frustrating (you’ll spend a lot of time checking your map to get your bearings), but it’s well worth the effort, if only so you can puzzle over who exactly lights all those candles in the dark world. Although the puzzles are often as simplistic as the art, these games can still provide a challenge. Resources are scarce, combat is slow and awkward, and as a player you never feel completely safe. Coupled with a relentlessly creepy, tense atmosphere, games like Darkwood and Lone Survivor deserve their place alongside the classics of survival horror. They’re just scaring you from a different perspective.